We’ve been meaning to write up about this clip for a few weeks now, but it keeps slipping our fragile little minds. 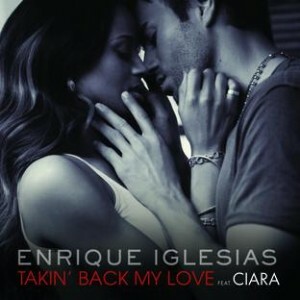 That said (and after a very quiet week on the local music side of things), now’s a good time for us to rectify matters as we present to you the single ‘Takin’ Back My Love’ – the final single from Enrique’s 2008 Greatest Hits album. And if the prospect of salivating over another Enrique clip wasn’t enough, you’ve also got to contend with Ciara too! So the clip opens and again – look, is it just us or does Enrique always seem to be fighting with girls in his video clips? He always seems to be having problems with the girls. So crotchety is he with this one, however, that he storms back inside, places a lovey-dovey couple photo face down and smashes his rosary beads (that’ll come back to haunt him). Enter Ciara (girl in question) who gives as good as she gets – she chucks artwork and clothes into the pool while he empties the fridge. CHILDREN PLEASE!!! They spend almost four minutes destroying everything that they own before realising at the end that their vandalism spree has turned each other on and they pash. Bah! I’m intrigued by the male-artist-and-rotating-roster-of-female-duets formula that’s been happening. Enrique’s recorded the song with Sarah Connor for her home market in Germany (juxtaposed shots of her singing her lines, into the existing video with Ciara)… and he’s also done a live version with our Gabriella Cilmi in Netherlands, I think. Do you reckon he’ll record with Cilmi for a local release? Kinda like when James Morrison’s “Broken Strings” kept getting strummed with everyone from Nelly Furtado to Keisha of Sugababes and of course, our Gabbi again haha!